I've altered many things over the years, but never shoes. So why now you ask? This month the STAEDTLER Design Team was challenged to alter a pair of White Gym shoes using STAEDTLER products. I can't draw to save my life, and tired a number of different ways to alter the shoes, so after many layers and attempts at altering, I decided to go the artsy route with something that was more me. 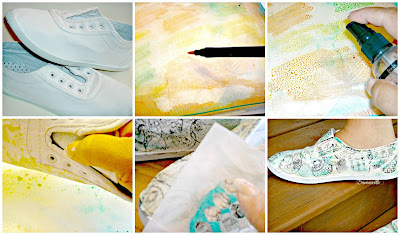 Prime your shoes with a layer of Gesso. Smash shoe onto Gelli plate, repeat as desired. Once dry, stamp images onto shoes using Archival Ink, then apply Gesso through the Just a Trace Tiny Ornament Stencil for added interest. Awesome project and those shoes will definitely turn heads. I love those shoes, Lisa! They must have been very fun to create and wear. Very fun! Love the colors and the stencil touches! I think these shoes are fabulous - just imagine how much they would cost in a designer store!!! Brilliant idea!